“Do they know what they sing?” exclaims my wife every time we witness an unbelieving musician singing a gospel-rich Christmas carol. How can there be no response to people singing such powerful words? Do they not know what they sing? Christmas carols are theologically rich and preach Christ. Yet, those who sing them on stage remain unsubmissive. Do they not know what they sing? Every Starbucks we walk into and every church in the country will be playing gospel-rich carols. But, do we actually know what they say? When we sing and hum along, do we know what we sing? The dictionary defines a carol as a song or hymn of gladness. It doesn’t have to be about Christmas, just anything that is joyous or brings gladness of heart. But, what greater thing is there to sing about than the birth of the savior of the world? What is more lovely and joyous than the incarnation of God that will prove Christ to be the only worthy sacrifice? What is more praiseworthy than the miraculous virgin birth by which all blessings would soon flow? Christmas carols are a wonderful heritage to the church and preach to our hearts every Christmas season. Another famous hymn written to defend the deity of Christ in the 5th century was Of the Father’s Love Begotten by the Spanish poet, Prudential. Hymns such as these were soon after used to celebrate the birth of Christ on Christmas and other special days. In the 9th and 10th centuries, sequences of rhymed stanzas were developed in north European monasteries. In the 12th century, a Parisian monk, Adam of St. Victor, began to derive music from popular songs and introduce something closer to a traditional Christmas carol we hear today. Christmas was not “commercialized” until the 13th century with St. Francis of Assisi, who recognized the unpopularity of Christmas carols and began to conduct plays and music in the native languages of France, Germany, and Italy. Many of the carols we sing today are dated to the Reformation, when Martin Luther penned some of the most familiar hymns. John Newton and Charles Wesley revived carol writing in the 1700-1800s, penning carols such as Hark the Herald Angels Sing and others during the revivals of England. It isn’t by chance that most of our doctrine-rich Christmas carols are dated during the years of doctrine reformation. These songs represent thousands of years of Christian history. These songs keep Christ alive by preaching to our hearts as we sing along. 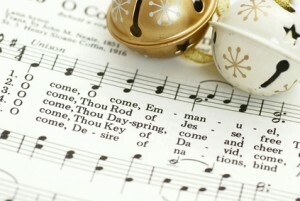 Why do Christmas carols matter? They matter because God made us to sing. When God’s word enters the regenerate man, His truth tugs on the strings of our heart and reverberates throughout the soul of man, producing worship. Every Christmas season, these carols keep Christ alive in our hearts. There must be singing, especially when recalling the birth of our savior. Carols keep Christ alive and remind us of the peace, hope, and joy that came with his birth. This song unites doctrine and delight by highlighting the deity and incarnation of Christ, which results in adoration. This song is a rally cry to the faithful who believe such truths. It calls us back to our rightful place before Christ: worship. While we may have our favorite Christmas carols, there is one that should top your list: Philippians 2:6-11. …who, although He existed in the form of God, did not regard equality with God a thing to be grasped, but emptied Himself, taking the form of a bond-servant, and being made in the likeness of men. Being found in appearance as a man, He humbled Himself by becoming obedient to the point of death, even death on a cross. For this reason also, God highly exalted Him, and bestowed on Him the name which is above every name, so that at the name of Jesus every knew will bow, of those who are in heaven and on earth and under the earth, and that every tongue will confess that Jesus Christ is Lord, to the glory of God the Father. The incarnation is the central miracle of Christianity. It is the most grand and wonderful of all the things that God has ever done. This is the priority of a Christmas carol, and so this passage should top them all. Paul combines the condescension of the second Person of the Trinity—his life and death in human form as the redemption for fallen mankind. Not only that, but God is the author. That alone should do it. This passage is said to be a Christological gem that sparkles brighter than any other in Scripture. And like any good song, this hymn was primarily meant to motivate Christians to live like their Lord and Savior. As the aforementioned verses show, our new life begins in song; revelation shows us that our eternal life is a life of melody sung unto God. May we not just sing to sing this Christmas, but sing to praise God and keep Christ alive in our hearts.